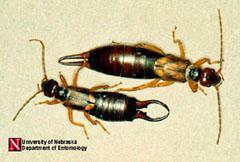 Earwigs are elongate, flattened insects, that may be light red-brown to black in color. They are easily recognized by their forcep-like appendages (cerci) on the end of the abdomen (Figure 1). The size and shape of the cerci vary between species and between males and females. These insects have chewing mouthparts and long, slender antennae and are either winged or wingless. If wings are present, the first pair are hard and very short, barely covering the first segments of the insect's abdomen. There are two common species of earwigs found in North Carolina. The European earwig is about 1⁄2 to 3⁄4 inch long, with banded legs and reddish head. The ringlegged earwig ranges from 1⁄2 to 3⁄5 inch long and is black-yellowish underneath with legs having dark crossbands. Young earwigs (nymphs) are similar to adults and will have a white to olive-green appearance and do not have wings. Earwigs get their name from a European superstition that these insects enter the ears of a sleeping person and bore into the brain. In reality, earwigs inhabit the soil, rotting logs, and other sources of moist organic matter. During the spring or autumn, the female earwig lays 20 to 50 smooth, oval, white or cream-colored eggs in a chamber in the upper 2-3 inches of soil. Earwigs are somewhat unusual (among insects) in that the female cares for the eggs and for newly hatched nymphs (immatures) until they molt for the first time. The nymphs leave the nest and spend one season maturing. Both eggs and adults overwinter in the soil below the frostline to escape the cold temperatures. Earwigs are easily killed by residual insecticide treatments in cracks and crevices, along baseboards, beneath cabinets, along door and window sills and other hiding places during the day. Unfortunately, control will be short-term due to new earwig entry from outdoors. Emphasis should be placed first on reducing conditions and access points favorable to earwig invasions. For best control indoors, one must first control earwigs outdoors. Earwigs are attracted to lights. Reduce lighting around doors, windows and other potential entry sites. For exterior lighting, use sodium vapor yellow lights which attract fewer insects compared to white, neon, halide, or mercury vapor lights. Earwigs need and are very attracted to moisture around homes, particularly when the weather turns hot an dry. High populations may be present around foundations, in landscaped yards, in mulch, under boards, etc. Eliminate damp, moist conditions in crawl spaces under houses, around exterior water spigots, air-conditioning units and along house foundations. Rain gutters and spouts should carry water away from the house foundation. 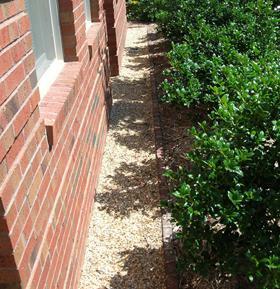 Change landscaping by creating a clean, dry border immediately around the foundation wall. Use a 12-18-inch gravel border to make an attractive barrier against earwigs and other invading pests (Figure 2). Use caulking compound, putty and weather stripping around doors, windows, pipes and other entry sites, especially at the ground level. Outdoors - earwigs can be trapped outdoors in cardboard boxes baited with oatmeal or bran with small (pencil-size) entry holes punched in the sides near the bottom. Place burlap bags, canvas, newspapers or other cover material in mulch, shrubbery and similar habitats to collect individuals the following day. Shake specimens into a bucket of soapy water if you want to kill them or simply shaken them out some distance away from your house (if you're willing to carry it that far). Indoors - you can use ordinary sticky traps (the "Roach Motel" type) placed under sinks or other moist areas where you have seen earwigs. You can also remove them with broom and dustpan or by vacuum cleaner. There are many insecticides labeled for earwig control. However, the first step is to carefully check for earwigs in areas such as under sinks, dishwashers, tubs, or around doors and windows, where moisture might attract them. Indoors - you should focus on cracks and crevices where earwigs might hide. Any indoor treatments should supplement pesticide applications outdoors since earwigs do not typically become established indoors, other than in areas of high moisture. Insecticidal dusts and residual sprays are effective when applied to baseboards, beneath cabinets and other hiding places at the floor level. Outdoors - you can treat 18-24" of the foundation wall and possibly a 3-6 foot band around the building adjacent to the foundation (perimeter treatment) to stop or limit earwigs from getting indoors. There are also some granular baits that can be used outdoors for earwigs, crickets and cockroaches. Granular baits contain a food attractant and an insecticide. They are not to be confused with the common granular insecticides, which are used for killing white grubs and other soil-inhabiting insects. If you plan to use the baits, do not treat these same areas with regular insecticides. Pesticide selection is critical to avoid using products that might injure ornamental plantings or flowers around the house. If earwigs are damaging young plants in the garden, select an appropriate insecticide to protect the foliage. Always read the pesticide label and follow directions and safety precautions. Figure 2. Use a gravel border next to your house foundation to keep pests away.